Listen here or use the Flash Player on this page for all episodes. Thank you to Quince & Co for sponsoring Knitting Pipeline. Three Bags Full still has FREE Shipping through May 31, 2011. Promo code "piper". Thanks to designers Brenna Kotar (Hoot Cardigan) and Rose Beck for two copies of the wonderful Be Mine Collection of Shawlettes. More owl info: Getting Wise to the Owl article from NYT. Shared by Jaykay. Recent sightings in our woods are Indigo Buntings and Scarlet Tanagers. The Rose-breasted Grosbeaks, which are indeed in the sparrow family, are still visiting the feeder. We hope they are nesting in our woods. House wrens are raising a brood in one of our birdhouses. I love waking up in the morning to the house wren's bubbly song. Estelle Cardigan by Melissa LaBarre. Despite my prediction that the sleeves﻿ on my Estelle would be smooth sailing, I have had a few challenges. They were a little tight in the upper arms and then I overcompensated and I made them too large. One sleeve is finished but may be a little short. See my project notes here. I felt it necessary to take a little break from Estelle so I cast on for And So Are You, a crescent-shaped shawl from the Be Mine Collection by Rose Beck. I am using Opulence (silk and wool) from The Woolen Rabbit. I have been using The Felted Join in Estelle and the Norwegian Setesdal Sweater. To be more civilized I have refined the name and the technique. This is often referred to as "the Spit Join". Instead of using your own saliva (which still works in a pinch) I use boiling water and then make myself a cup of tea to drink while I admire my handiwork. A couple of questions about e-readers were addressed. I answered Judiuni's question about using lifelines. Charts Made Simple: Understanding Knitting Charts Visually by J.C. Briar. Glass Iris Publications. J.C. Briar's website is here. Celtic Cross Pipes and Drums competed in the St. Andrew's Highland Games in Chatham IL on May 21. Kevin and Paula at the Celtic Cross "camp". Kevin is the big voice you hear at the beginning of the podcast. Visit my Longaberger shop for special offers through Monday May 30th. There are always specials and sales! Video Tutorial on Meghan's method of picking up stitches after unraveling your work. 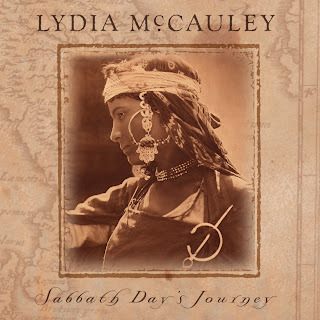 All Shall be Well from the album Sabbath Day's Journey by Lydia McCauley. I love your pod cast! Paula, I enjoyed this episode so much, and I especially appreciated hearing about your needing to leave our friend "Estelle" for a couple days. Like you, I love the pattern and oh my gosh, the yarn is the best, but the fit of the sweater has me feeling down -- in a day or two, I'll be able to pick it up again with a smile. I so appreciate your honesty with everything from sweater sleeves to piping competitions--it is one of the many things that endears me to your podcast. When is your Chicago game and where? Okay, I'm off to watch the video to so I can enjoy seeing how the "felted join" is more civilized. You Rock! I am a new listener and a huge fan. your knitting I feel like I am in your living room. Your an asset to the knitting community. I would love to purchase a bumper sticker with your logo. Let us know when they become available. As always, listening to your podcast was delightful. I wanted to especially thank you for the tip about the life line: it seems to cleaver to thread a string through the little hole of the KP option needles! I was always scared by lace, due to the fact that, if I mess up (and it usually happen a lot in my knitting! ), I won't be able to fix it. The other day, I felt in love with Jared Flood Rock Island shawl (it looks so lovely for summer), but I was way too scared by lace to even think about knitting it. But now, thanks to your tip, I am contemplating starting it! Paula, Great video for the Spit Join! Or the Cup of Tea Join! Am dreading working on the Estelle sleeves...but of course have to get there first! Thank you for the video tutorials. It helped me see exactly how they work. Especially the dropping of stitches and picking them up. Perfect!